Home > Uncategorized > Big Adventure. Small Wheels. We’ll be putting our trusty Surly Long Haul Truckers in storage to travel on Bromptons. Why? 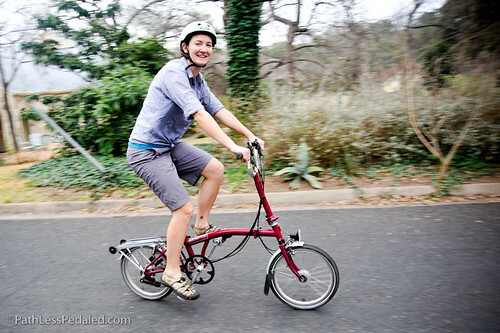 Riding around on a Brompton is simply a fun experience, and being able to fold them into a really tiny package is just cool. Our plan is to pair the cycling with train travel. We think more people should get out on bikes, but we also think the train is overlooked as a contemporary means of travel. Since the two go together so well, we’re going to focus our whole next trip on the joys of bike and train travel. As much as we love our Surlys, they feel sluggish compared to the Bromptons, and they’re just not as simple to take on multi-modal travel. 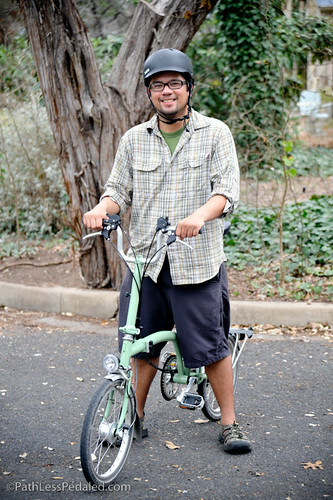 So, meet Brompton… The Brompton is a folding bike with 16-inch wheels. It has the smallest and neatest fold you can get in a folding bike. The design has been around since 1988, which means that it’s a mature product that performs like a ‘real’ bicycle. You may be wondering about the tiny wheels. Will we really be able to tour on these bikes and ride them up and over the mountains? Yes, we think so. The Bromptons are geared in such a way that we have almost the same range of gears as we had on the Surlys, they’re just broken down into a smaller number of gears (six). Because they’re geared so well, the small size of the wheels doesn’t affect the handling the way you might initially think, and we don’t have to pedal harder or spin faster in order to keep up with a larger-wheeled bike. What about the carrying capacity? 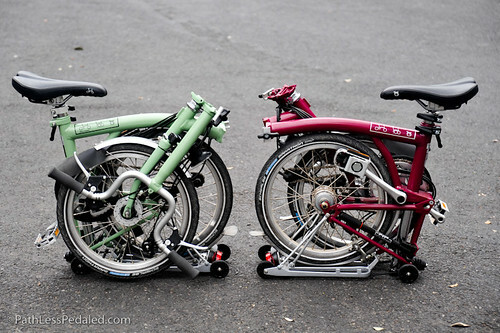 The Bromptons are decidedly smaller than the Surlys and are not intended for hauling around as much of a load as the Surly. But that doesn’t mean they can’t carry gear. Brompton makes a great front touring bag that’s approximately the size of a pannier and a half. We’ll be using these bags, as well as a second bag on the rear racks (likely a backpacking-style backpack). We will have to pack lighter and carry fewer items with us, but we see this is a blessing. Even though we were continually lightening our load on our last trip, we still had 70 or so pounds of gear by the end. That’s just too much stuff and too much weight! As soon as we figure out our reduced selection of gear, we’ll share that here. Like before, we’re trying to not overly plan our route. We’ll be starting from Portland this spring and heading East, across the northern part of the US and into Canada. For both of us, one of the greatest parts of the last trip was meeting people along the way and interacting with all of our wonderful readers. So we hope that you’ll all come along on this journey as well! If you have suggestions for places we should check out, please let us know. As we’ve been riding around on the Bromptons, we’ve started to notice something… we’re smiling a lot! These bikes are zippy and playful and fun to ride, not to mention rather head-turning. We’re having so much fun already – and we can’t wait to take them out on the open road! We’re currently raising funds for train tickets and video equipment to really make the experience come alive for our readers. If you want to contribute, go here! Best of luck to you two! We’re really excited to be following and promoting your adventure. Bikes + trains, what’s not to love! All the best on your next adventure, and remember that the bike is secondary to the journy! I run a Birdy, which is also small in size, but large in producing a massive smile on my face whether I am going into town or out on a phototrip. But I really wanted to ask you guys advice. The bike trailer I use is great for carrying a lot of camera gear that I need on trips, but it is a little unwieldy offroad in the sort of locations I want to be. Have you ever come across dedicated panniers for carrying cameras? I also seem to have read a lot of comments also saying carrying cameras in panniers is bad for them because of all the vibration. My cameras have a rough life anyway, so I can’t imagine that being on the back of a suspension bike is too much worse, but you never know. Any thoughts or advice would be appreciated. Looking forward to following you on your travels. I’d love to get your comparison of the Brompton with the Dahon Speed TR. Great fun ahead…My hubby, Ron, and I love train trips and bike tours..We have reservations for the fall..We are honored to be able to follow your trip..We will be with you in spirit..safe trip…Life is Good!! – The Schlumpf Mountain Drive is a great way to get low gearing without giving up the high end. Note, however, that it doesn’t work worth a darn with the Brompton Wide Range hub; several gears overlap, so you have about eight useful gears instead of 12, and they’re spread across a wider range. – Putting a bag on the rear rack means you can’t fold the bike as readily. I attached a Xootr CrossRack Bicycle Rack to my seat post high enough that the seat post still went down far enough to lock the bike together when you fold it. You need to pad the seat tube with some sheet rubber padding, which you can get in the plumbing section of the hardware store so the clamp doesn’t dig into the seat post. At my Ace Hardware, it’s called “red gasket.” I can send you pictures if you’d like. – For a bag on the Xootr rack, I use the Arkel Utility Basket. The combination has hauled groceries many a time and took me on a week-long jaunt through the Northwest a while back. – Todd’s right about the wonders of Ergon grips. It’s great having the extra hand position to break up the day. – If you replace the EazyWheels on the rear rack with Razor scooter wheels, the bike rolls a little better when folded, and the Ergon GC3s clear the ground better. (The EazyWheels also get pretty beaten up after a while.) The metric bolts that screw into the frame (6 mm?) are beefy enough that they won’t bend under normal use. However, for the bolts that secure the wheels to the rack, I had to get 1/4″ grade 8 bolts and drill the holes out just the tiniest bit. (Bolts that just fit the holes soon bent, and my hardware store doesn’t have grade 8 bolts small enough to fit those holes.) The wee bit of drilling hasn’t affected the rack. – There’s a new Brompton group in Seattle: http://unitedbromptonriders.org/. Drop us a line if you’re headed for Seattle, and we’ll take you out for a beer. – Yes, I know, I should get all of this advice onto my sadly neglected blog. Wow. Scott, thanks for all the tips! Hope you get more stuff on the Brompton site! My brompton is about 14 yrs old. Saw it online and ordered it, love to leave it in the car for those quick rides and city riding on and off trains. Such a great idea you both have for this trip. Good luck and am following your travels ! Stuart, what are the small modifications you did on the rear rack to put an Ortlieb paneinr ?I’m very interested in your answer because I will soon have a Brompton M6RN and plan to do quite long bicycle trips.Thanks for your answer. I’ve done that too. In fact I know a person who buys a $20-$30 bike every trip, tunes it up a touch, names it, rides it for the trip and then doteans it to someone who needs a bike when she leaves.